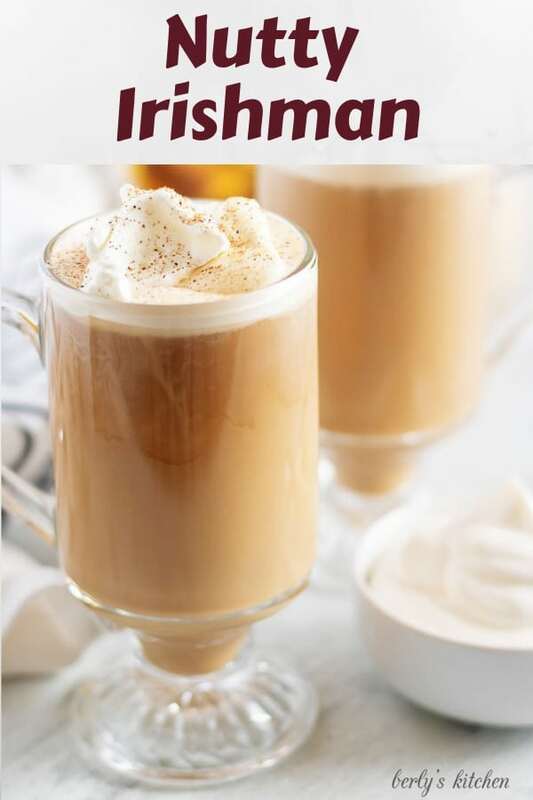 The Nutty Irishman a is grown-up coffee drink that’s smooth and comforting. 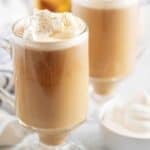 Made with Irish Cream and Hazelnut liqueurs and topped with sweet whipped cream. Hopefully, Winter will soon loosen it’s grip on us here the States. Until then, we have to do something to keep ourselves warm. 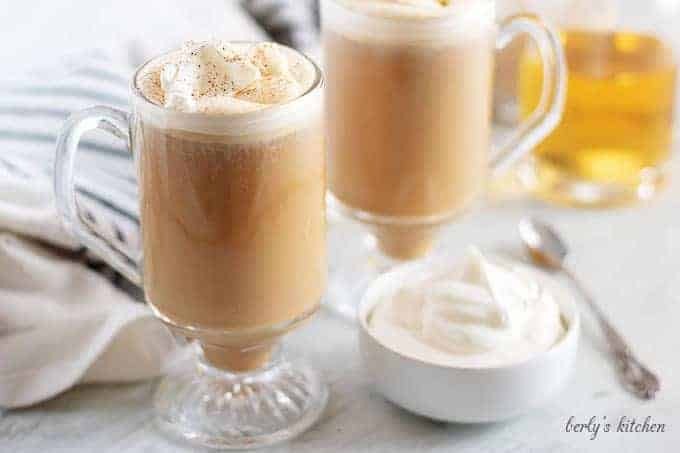 What better way to fight off the nighttime shivers than a warm and comforting Nutty Irishman? Kim and I adore drinks like this. 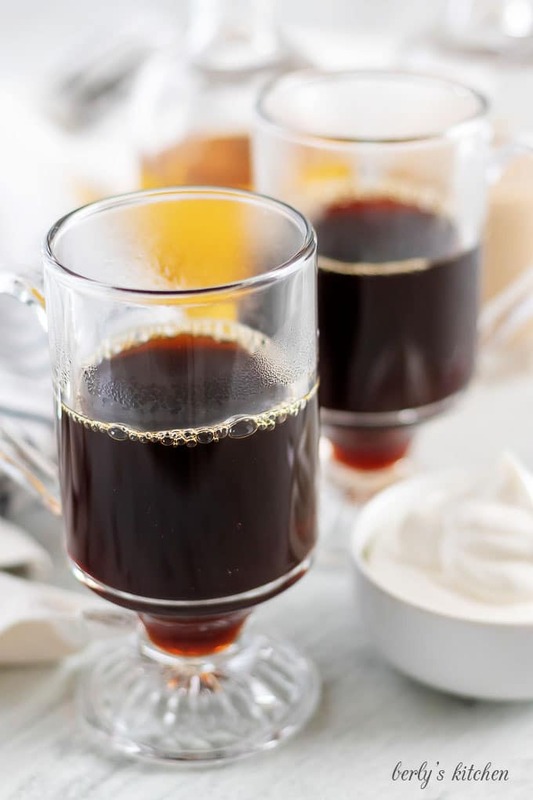 Coffee mix with hits of alcohol, like smooth Irish Cream and Hazelnut liqueur. It really does warm your mind and body. Given that temperatures continue to stay below freezing and frozen precipitation is everywhere, a beverage like this might be the perfect way to end a long, chilly day. Since the recipe is easy to make and doesn’t require a lot of guidance, I will go through the instructions rather quickly. Afterward, I’ve decided to add a quick note to help you on your next alcohol run. We hope you enjoy this drink as much as we do. With that being said, try not to overindulge as it does contain alcohol and we all know the consequences of irresponsibility. Now, how about we head over to the bar and have a drink? This one is simple. Brew about one (1) cup of coffee and then pour six (6) ounces of the coffee into a mug. The coffee mug should be able to hold ten (10) to twelve (12) ounces of liquid. Then measure out and pour in the Irish Cream and Hazelnut liqueurs. After that, add the whiskey, stir, and top with any optional garnishments you desire. That’s it your after dinner cocktail is done! Enjoy it whiles it’s hot, but please drink responsibly. Alright, let’s talk about alcohol. These days, I hardly drink, so when I do, I make sure to buy the good stuff. That means, no skimping. Trust me, I know how expensive alcoholic beverages can be and not everyone can afford top shelf or imported brands. With that being said, that doesn’t mean you have to buy bottom shelf. Oh, when I use the terms, top shelf and bottom shelf, I’m being literal. In Arkansas, in order to get liquor or liqueurs, you have to have to go to a liquor store. When you walk in, all of the bottles are neatly arranged (if they’re not, I leave immediately). The bottles of booze are usually arranged by type, then price. The cheap stuff, or rot gut as we call it, typically occupies the bottom tow (2) to three (3) rows. Since I’m not rolling in money, and who is these days, I tend to reach for the bottles in middle or towards the top of the shelf. So, when I say, “don’t skimp,” that doesn’t mean go for the stuff at the very top, it means try go for the middle. To be honest, for me anyway, buying the top shelf is wasteful. Not because of the price, but because I wouldn’t know the difference between middle and top either way. In other words, I probably don’t even know how to appreciate it properly. In closing, let me put it this way, buy what you can afford, but keep in mind that quality will always affect flavor. If you wondering what kind of garnishes would work for this recipe, then consider using whipped cream or nutmeg. You could even make your own homemade whipped cream. It’s super simple. All you need to do is whip cold heavy cream until begins to form peaks. It can be flavored with all sorts of extracts (like vanilla or mint) and sweetened with sugar (we like using powdered sugar). Once you start making homemade whipped cream, I doubt you’ll go back to the store bought stuff. I’ve heard people ask, “What does Frangelico taste like?” Well, it’s a hazelnut liqueur, so it tastes like hazelnut and alcohol. The liqueur is smooth and is used more as flavoring agent in cocktails and drinks, like the one we shared today. Looking for more cocktails? 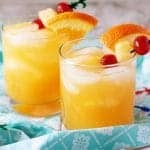 Then take a look at some our favorite grown-up drinks! If you like our Nutty Irishman recipe, please leave us a comment and rate the recipe card. You can also find us on Facebook, Pinterest, Twitter and Instagram searching for Berly’s Kitchen! 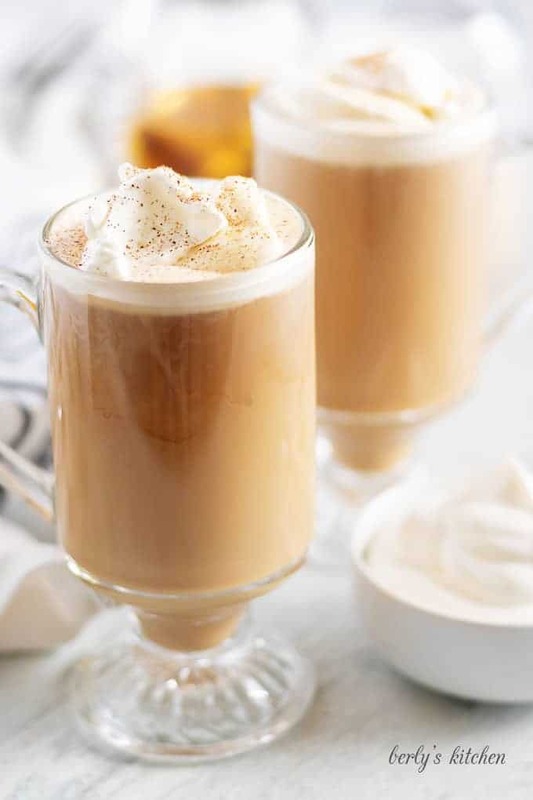 The Nutty Irishman is a grown-up coffee drink that's smooth and comforting. 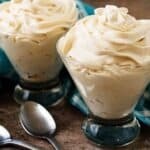 Made with Irish Cream and Hazelnut liqueurs and topped with sweet whipped cream. 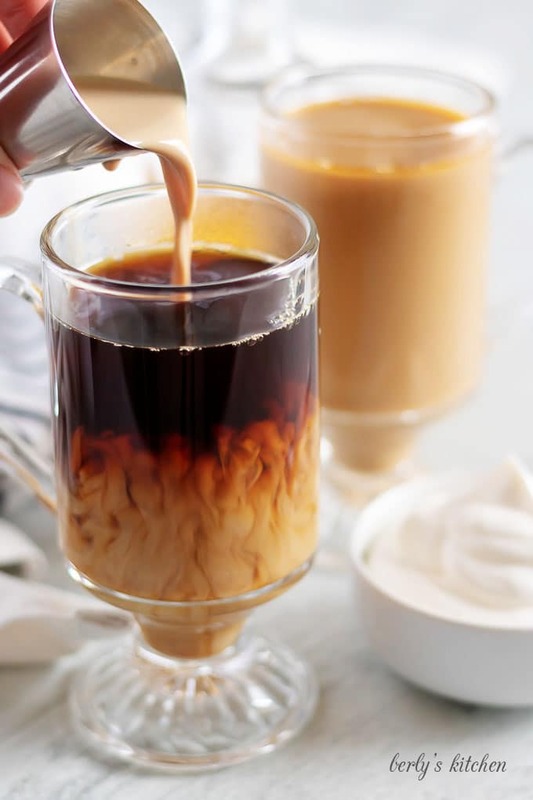 Pour hot coffee into a mug. Add Irish Cream Liqueur, Hazelnut Liqueur, and Irish Whiskey (if using). Stir to combine. Top with whipped topping and ground nutmeg (optional). Serve hot! The calories listed are an approximation based on the ingredients and a serving size of one (1) drink. It does not include the whipped cream seen in the photos. Actual calories will vary. Furthermore, the Nutty Irishman recipe only makes one (1) drink.